In this week's Basic Muay Thai for Beginners, Fighting Insider is giving you the basic Muay Thai kicks that a future MMA fighter must know. 1. When executing a round kick, spin on the ball of your foot. 2. Follow through throw kicks to your target. 4. Spin your hips to make a round kick. 5. Keep your body erect. 6. Return your leg back to its original position, unless you’re shifting into a new technique. 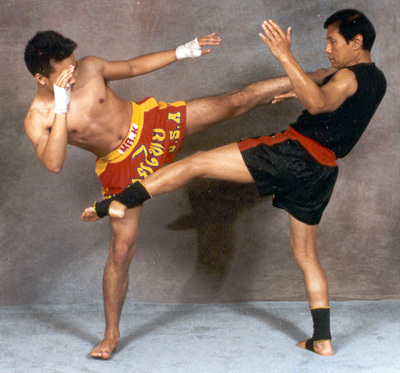 The most basic kick used in Muay Thai is the rear leg and front leg kick techniques. In rear leg kick, its target is the nerve that runs down outside of the opponent’s thigh — just a couple of inches above the knee. When executed properly, it can give a devastating result. The rear leg kick works well to counter a straight advancing opponent. Next is the front leg kick. Though less effective than a rear leg kick, this is useful in throwing an opponent out of balance. More often that not, the front leg kick should be followed by another attack. Still looking for more Muay Thai techniques? The Muay Thai clinch is coming next week so keep it posted here on Fighting Insider.